This is a guest post by Jim McBean, a blogger, dog lover and guardian to a Border Collie named Sweety and an American Pit Bull Terrier named Zeus. Jim blogs at http://doggybytes.ca which focuses mainly on canine health and nutrition. I asked Jim to write this post after I found myself with a measuring cup in one hand and a Ziploc bag in the other, not knowing how much kibble to pack for Chloe. The package had a suggestion, but after reading Jim’s recent posts I no longer trust dog food packaging the way I used to…. How much and how frequently should you feed your dog? There really isn’t one answer to this question. Some people free feed their dogs, filling their dog’s dish and leaving it out all day for the dog to “nibble” on. Other’s feed their dogs “three squares” a day. I once knew a lady with a golden lab named Buddy. Buddy had to eat “lunch” every day at 12 noon, because well, that’s “lunchtime”. I had a conversation with another lady, a cat owner who leaves a dish of cat food out on all three floors of her house, just in case her cat was hungry and didn’t feel like getting off the chair and go down to the kitchen to eat – I guess? You Don’t Need to Eat Today, You Ate Yesterday! Dogs didn’t evolve to eat on a schedule (nor did humans for that matter), they evolved to eat when food was available, most times after a kill. There would days, perhaps many days when little or no food was available at all. Other days after a kill they’d gorge themselves. Did You Know? Wolves can eat up to 20 pounds of meat and bone in a single feed. I feed my dogs a raw meaty bones diet once a day, with healthy, single ingredient treats offered randomly. Rarely do they eat the same food two days in a row, and they almost never eat at the same time every day. This is not to say that it’s a “bad idea” to feed your dog at the same time(s) every day. At the moment my schedule allows me to feed my dogs whenever, and whenever is usually when I wake up. Another thing I do is fast my dogs one day a week. No, this isn’t a mean thing to do, it actually gives their pancreas and digestive systems a break, and along with the RMB diet, more closely aligns with a diet that canines evolved to eat. Recommending a portion size for kibble, that’s a tough one. Every formula has its own feeding recommendations, which you’d think would make it easy to figure out how to feed Fido or Chloe – just follow the instructions on the bag right? Well unfortunately in many cases it’s not as easy as that. Take a recent study published in January by The Journal of the Americal Veterinary Medical Association, conducted by the Cummings School of Veterinary Medicine at Tufts University. The study looked at 93 commercially available pet foods (dog and cat) making “weight management” claims and showed that the caloric density of the pet foods studied ranged from 217 to 440 kilocalories per cup (kcal/cup), and portion recommendations ranged from 0.73 to 1.47 times the dog’s resting energy requirement. So basically double the calories and double the recommended feeding portions. Nice! For bigger dogs I shoot for 2% of their body weight in food from raw meaty bones or 14% over the course of a week. Many large dogs may only require 1% of their body weight daily, or 7% weekly. 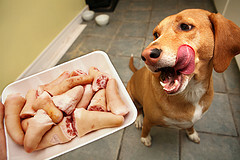 By the way, raw meaty bones should be about 70% meat and the rest bone – so more meat than bone. What do you do if you travel a lot with your pet, aren’t crazy about feeding kibble but feeding a raw meaty bones diet isn’t possible while traveling? There is a third option, and that is finding a good dehydrated dog food that you can bring along with you and rehydrate at feeding time no matter where you are. To be honest, I don’t know much about these products yet, but I did find a company online called The Honest Kitchen that I pointed out to my friends Rod and Amy Burkert of GoPetFriendly.com. They travel A LOT and wanted to feed raw, which isn’t feasible for them when they’re on the road, so they switched their pals Buster & Ty over to HK’s Force back in December. So far the reports coming from the GPF camp are of gleaming stainless steel food bowls (after eating) and very happy dogs! Balanced nutrition does not happen on a “by the day” basis, but rather “balanced nutrition” is achieved over time. In fact, no animal on this beautiful blue globe of ours has ever achieved a “balanced diet” on each and every day of its life. Think about it, have you or anyone you know, ever consumed every single required nutrient every day for an entire week straight? No, because it just doesn’t happen that way. Balanced nutrition is achieved by supplying a variety of necessary nutrients at varying levels over time. I could get into the implications that this has with regards to dogs eating the same nutrients in the same quantities every day over a its lifespan, but that’s another post. I can see problems occurring in pets fed multiple times per day, every day. Eating two or three times per day means that the pancreas has to produce digestive enzymes two or three times per day. In other words it has to work harder and over a number of years, this can take its toll. Potential weight gain by overfeeding is another common occurrence. To me, the notion of feeding a dog a daily fixed portion size doesn’t make much sense. As with people, there are several factors that dictate how much a dog should eat, age, activity level, health problems, metabolism etc. We know that when we gain weight we either need to increase our exercise level, decrease or restructure the amounts and types of foods we eat, or both. The same holds true for our dogs. Jim, a great post. When I saw the word “fast,” my eyes widened and I thought uh-oh. Why do so many of us fear fasting? It is actually a good thing to do–even for people–every once in a while. And portion size is another issue. Years ago a friend told me that when she goes to a restaurant she doesn’t finish everything on her plate. Restaurant portions are the same size–whether you weigh 110 pounds or 250 pounds. So, exercising some control in the long run benefits all of us. Fantastic post, Jim. We continue to be pleased by the quality and convenience of The Honest Kitchen’s Force product. As I write this comment, I am sitting on a bench seat in the dinette of our RV. The seat storage holds 6 boxes of Force, weighing a total of 60 lbs, that will hydrate to 258 lbs of food. And the dogs love it. This IS a great post, and folks who are impressed with it should look at Jim’s site for other posts that really dig into — and answer — the questions we have about canine nutrition (and, often, questions we didn’t even know we had! ).